In the Time of Love "Hard Cover"
Love—who can count its varieties, measure its force, uncover the masks it wears, or predict how it binds and divides? 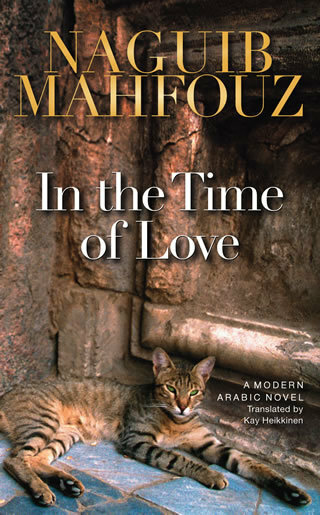 In this spare novel, master storyteller Naguib Mahfouz gives us some of his most memorable characters, widely familiar to Egyptians from the film version of the book: Sitt Ain, with her large house, her garden, her cats, and her familiar umbrella, strong and active, mother of the neighborhood; her son Izzat, so different from her, emotional and unsure of his way; and the friends of his childhood, Sayyida, Hamdoun, and Badriya, all their lives entangled and shaped over many years by the encounter of commitment, ambition, treachery, and above all love. This is a story in and of twentieth-century Egypt, which can be read on more than one level. The neighborhood and the motifs may be familiar, but they combine to tell a new and intriguing tale, with an unexpected outcome.